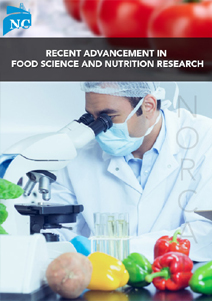 Recent Advancement in Food Science and Nutrition Research is an international, peer reviewed, open access, scientific and scholarly journal that publishes manuscripts like research, review, mini reviews, case reports and studies, short communications, letters, editorials, etc. from all the aspects of Food Science and Nutrition Research. We promise researchers, academicians, healthcare professionals to provide a forum to publish their latest research results online and also they can find recent advances in Food Science and Nutrition Research in our journals archive. Recent Advancement in Food Science and Nutrition Research is an international, peer reviewed, scientific journal. It is the science that understands the dealings of nutrients and other materials in food in relation to maintenance, development, reproduction, health, diseases and other mechanisms. The aim of the journal is to create a platform to researchers for publishing their Original Research, Reviews, Case Reports and Studies, Mini Reviews, Editorials, Opinions, Short Communications. The journal covers all accepts of food science and nutrition including Probiotics, Fermented foods, Sensory analysis, Food rheology, Space food, Food fortification, Food Pairing, Nutraceutical, Nutrigenomics, History of nutrition, Saturated facts, Nutrition taboos, Avitaminotics, etc. This journal gives opportunity for all researchers to promote their work in its various fields. we are now accepting the manuscripts for our upcoming issue.